What is the Prime Grind System? The Prime Grind System is a mechanical and chemical treatment for concrete and terrazzo floors that reduces regular maintenance costs by half that of traditional floor coatings or coverings. In some instances, the initial treatment is more expensive than coatings or sealers, but in the long term, maintenance costs are drastically less over the life of the floor and it never requires recoating. How long does Prime Grind last? With proper maintenance, a Prime Grind floor will last in excess of 10 years. The Prime Grind System uses machinery and diamond abrasives to hone the concrete terrazzo to a smooth surface. Then, a proprietary mixture of chemicals are used to fuse and strengthen the wear surfaces of the floor. This process increases the abrasive resistance and slip resistance without sacrificing clean ability or appearance. Colored dye may be used to achieve a color design scheme, if desired. Are there cure or wait times in which the area must be closed or out of service? The only time an area is unusable is during the procedure. Once completed, it can be opened to full traffic and/or use. Is it too technical of a procedure for my “in-house” maintenance staff to perform, or can we train our own labor? Deep Cleaning: Deep cleaning is a process performed to remove ground in dirt and grime that has accumulated over time in the stone and grout surface as much as possible. 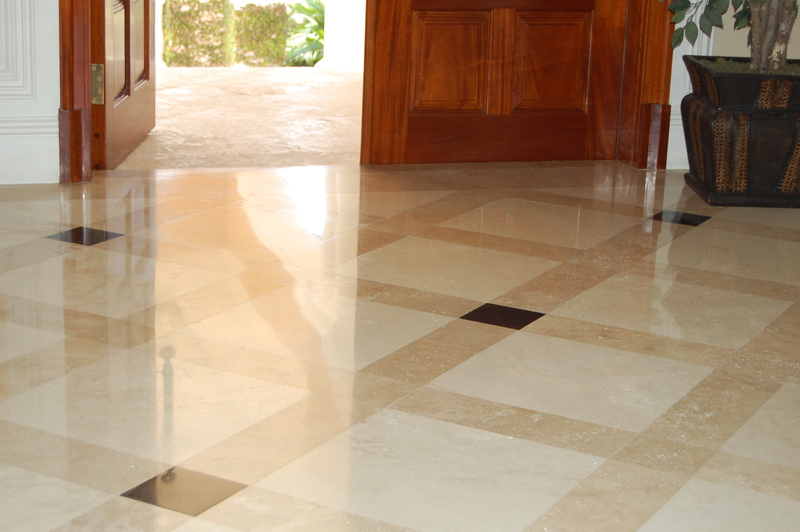 This cleaning of the surface prepares the stone and grout for polishing or sealing depending on the process to follow. Hertron has developed cleaners (1005 & Stone Soap and Tile and Grout Cleaner) that make these jobs easy. Honing: The process of applying an abrasive on the stone surface to achieve a desired look or resurfacing to produce a polished or matte finish. Stripping: A stone surface must be clean of all coating before any restoration can be started. Resurfacing: Resurfacing performs many duties. The removal of lipage, scratches, traffic wear patterns and modifying the surface to product the desired finish. Hardening: Hardening is a Hertron exclusive. Hertron developed the Prime Grind System for marble, terrazzo, travertine, and other calcified stone. Hertron also makes a densifying agent for concrete to assist Prime Grind in hardening this stone. These products densify and harden the stone surfaces which will extend the time between repolishing. Polishing: Prime Grind, Marble Supreme, Granite One Step and Granite Ultimate Black are the products we present to the industry to obtain the degree of polish desired for your customer. Sealing: Sealing is the necessary process to keep the surface stain free as long as possible. Sealers protect stone from most stains that are thrown at it daily.